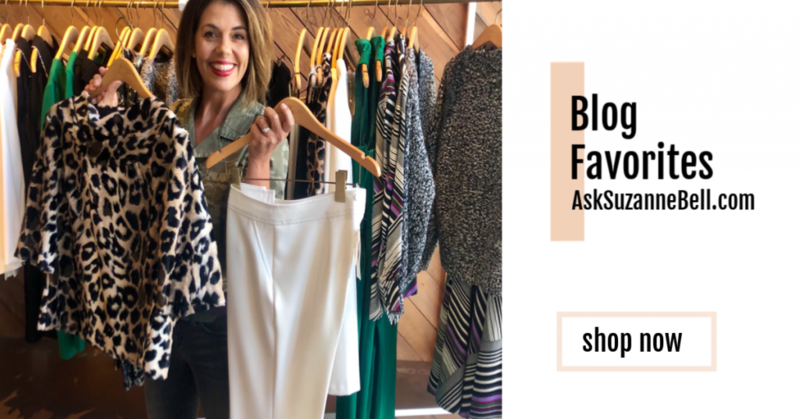 Last week, fellow fashion blogger Melissa Menzies, of YummoMummo and I hit our local Target by storm – seriously, we were crazy. I’m sure we confused some of the employees at 9AM Thursday – but, we were determined to deliver some fabulous deals for our readers. 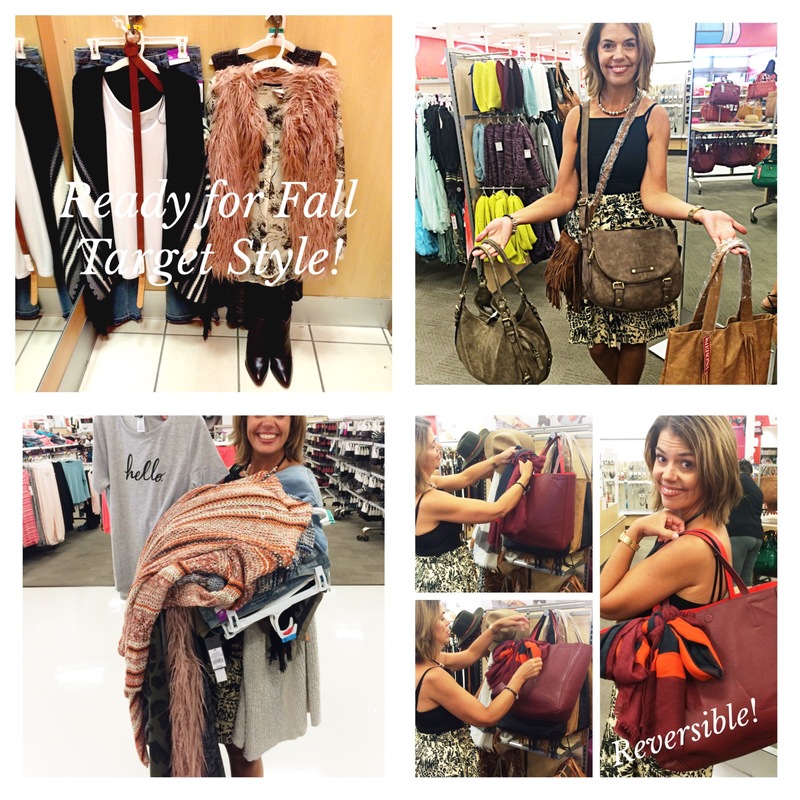 We wanted to show, how for very little spend, you can easily update your wardrobe for fall! 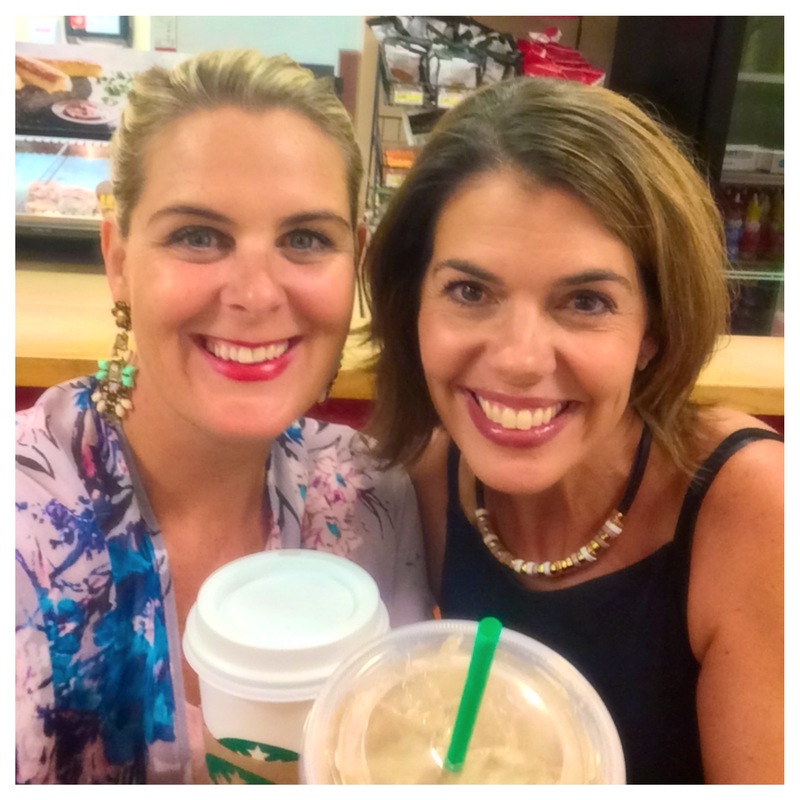 Here we are grabbing a latte, at the Starbucks Target, gearing up for some real life power shopping! 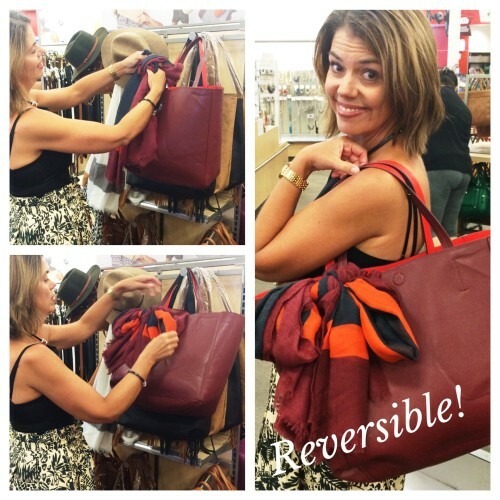 Our goal, was to bring you fabulous, on-trend items, at great prices. 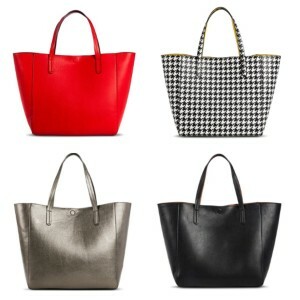 Melissa’s items are live on www.YummoMummo.com, so be sure to pop over to her website to see the rest of our picks, you won’t want to miss ’em! 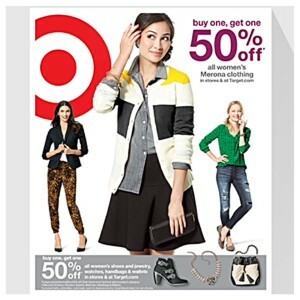 Just when you thought it couldn’t get better, than a hand picked fashion blogger list, this week, Target is running their BOGO promo on women clothing, accessories and shoes. 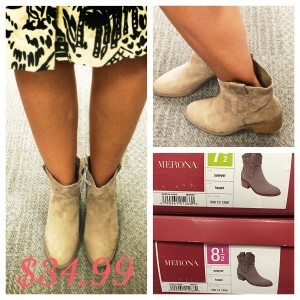 Buy one, get the second item 50% off, whohoo!! 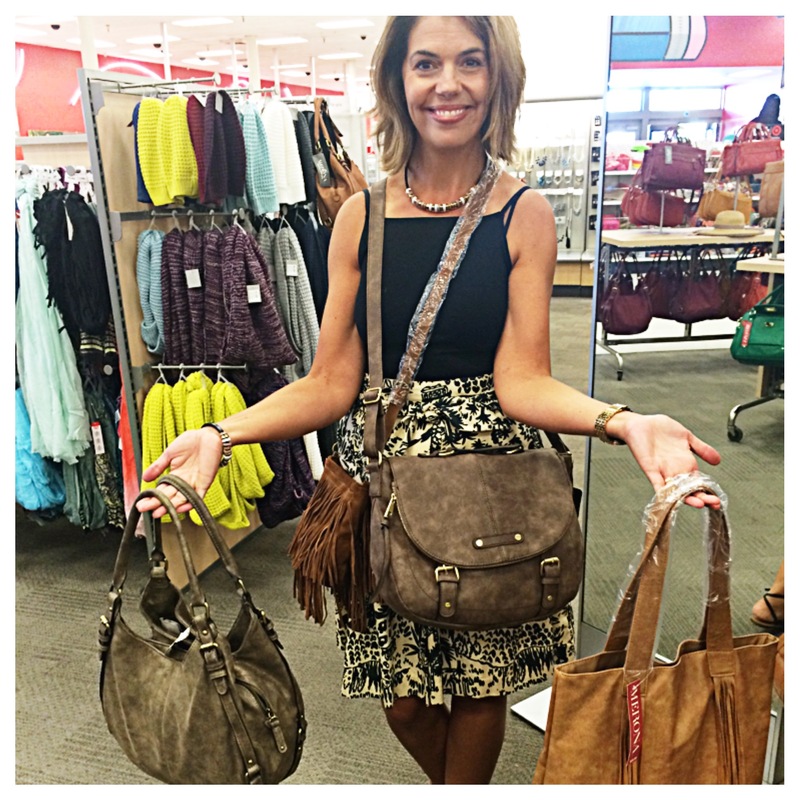 Melissa and I personally tried on, and inspected everything on our list – here’s a look at our faves! 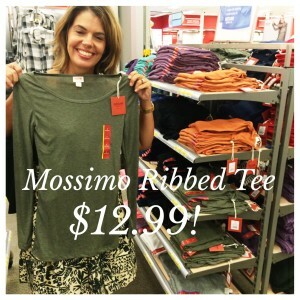 LOOK FABULOUS FOR LESS, TARGET STYLE! You ask, does it truly reverse? We wondered the same – here’s Melissa testing it out, and Ladies, yes it does! 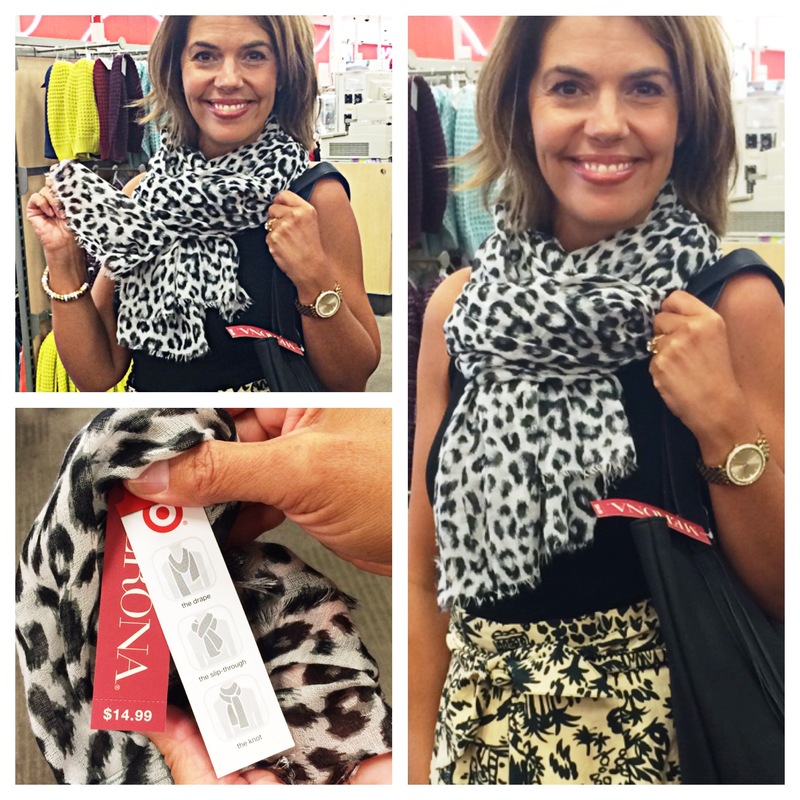 I love tying a scarf onto my bag, not only for a pop of color – I find it comes in handy, for those cool fall mornings and afternoons. 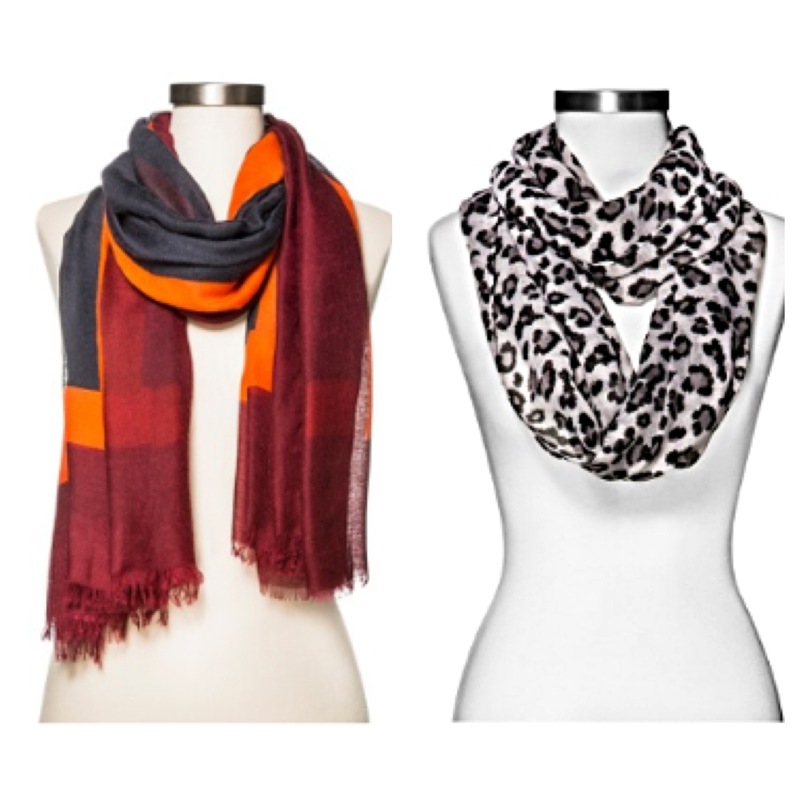 With this weeks promo, you could own both scarves for under $25.00! 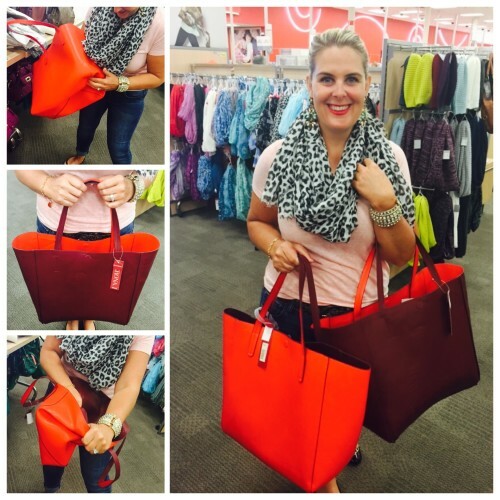 Target has collaborated with Aldo, for the A+ by Aldo line. 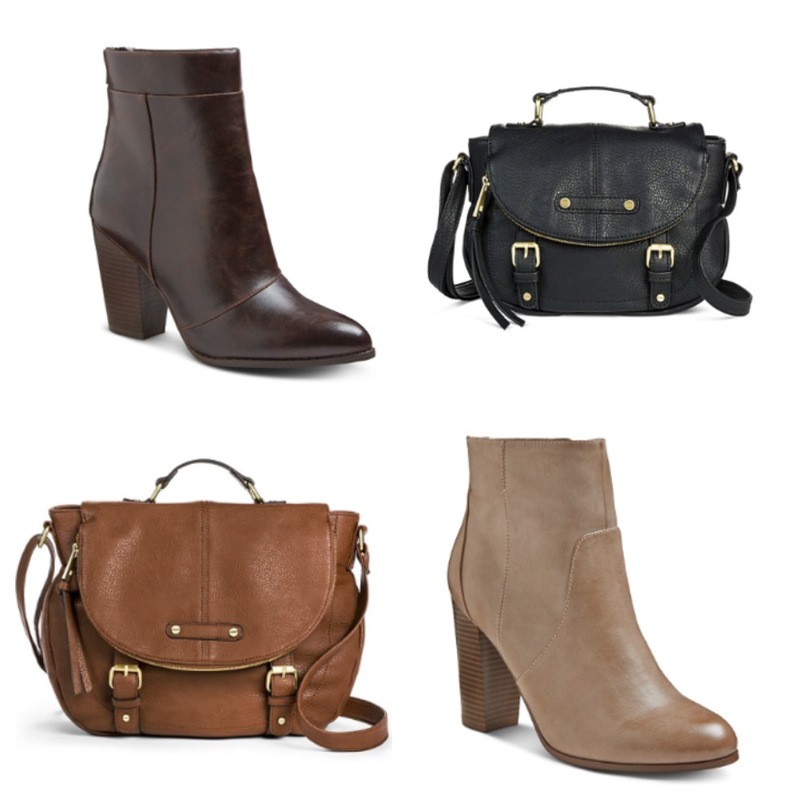 We found great looking bags and boots by Aldo, new to Target. 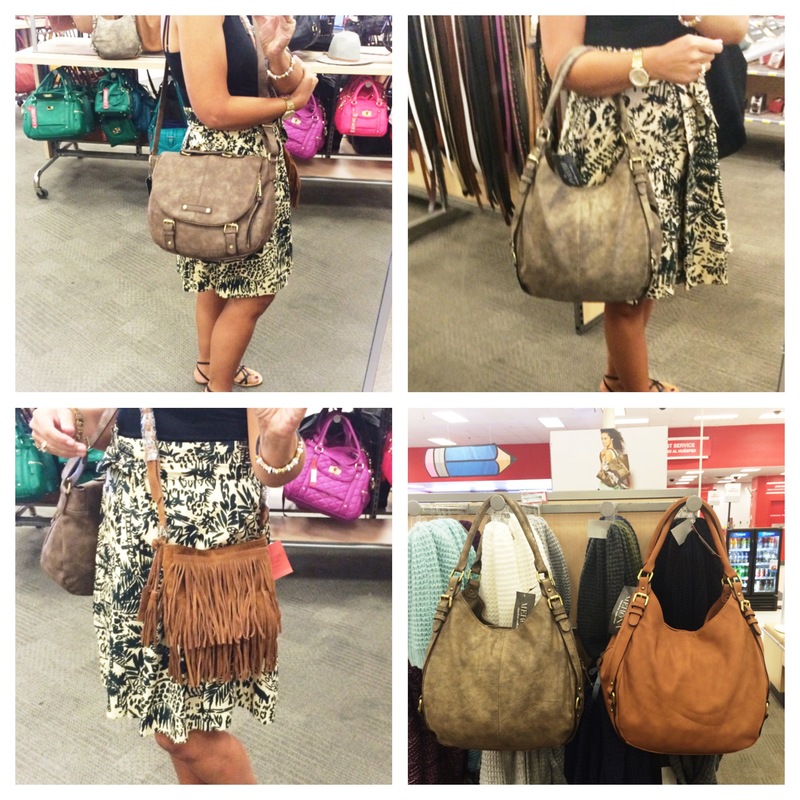 Clockwise from top left: Aldo cross body | Aldo hobo | Mossimo fringe bag (feels like suede!) 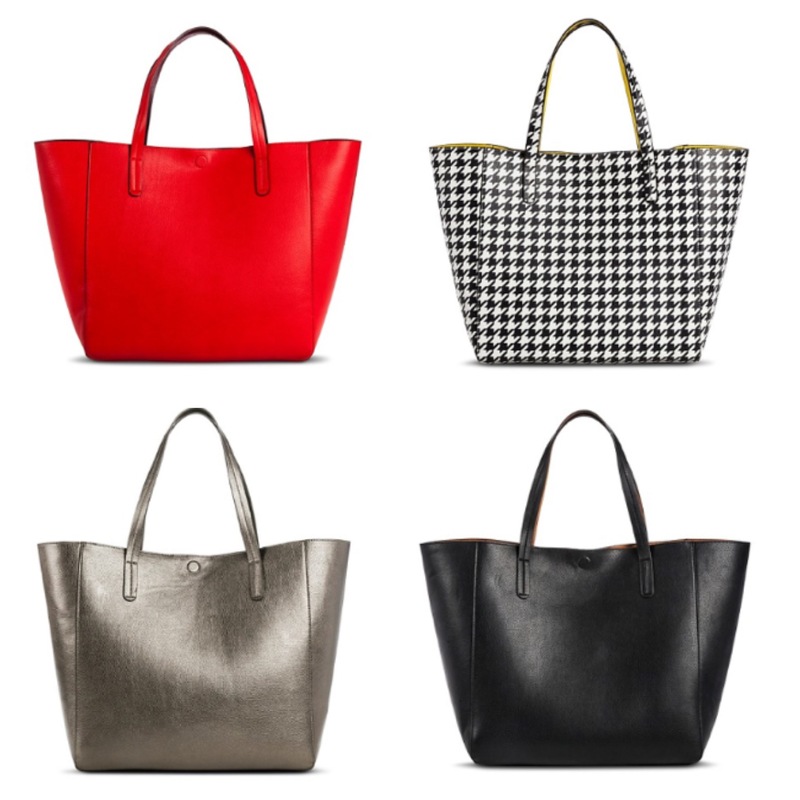 Find more bags over on YummoMummo! A look at ‘Eagen’ on. Ran true to size, and for me, were comfortable. 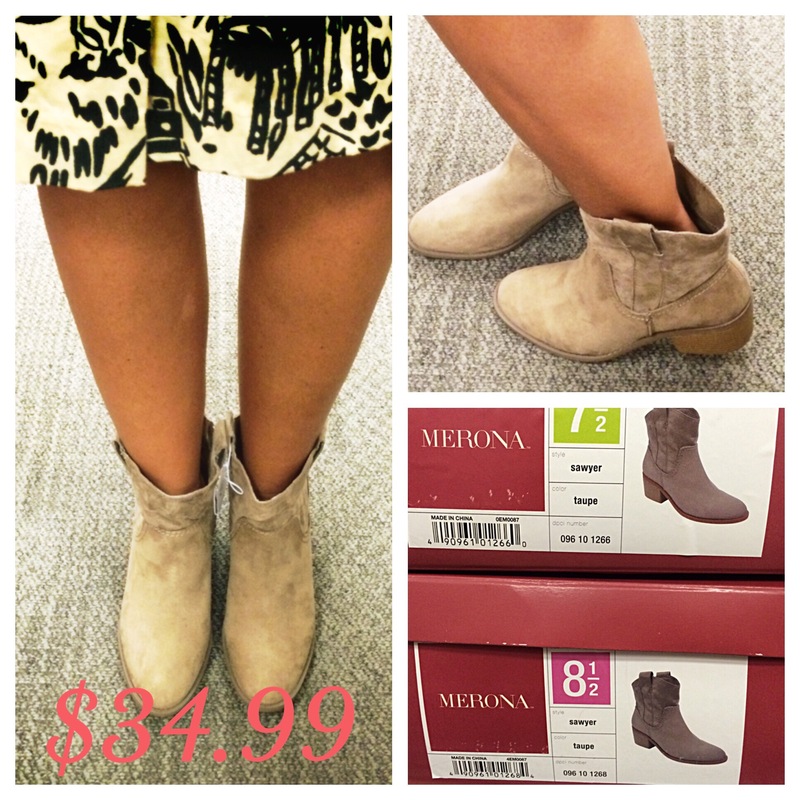 I also liked this Merona boot, $34.99. True to size. Sam and Libby Cheetah pump, more colors available on line. The black stripe up the back is a fun detail! True to size. Pop over to YummoMummo for details on these fun Mossimo slip-ons, along with other fab shoes, $24.99. Knotted belts are big for fall, over ponchos, wraps and cardigans. The trick is getting the knot to lay correctly. 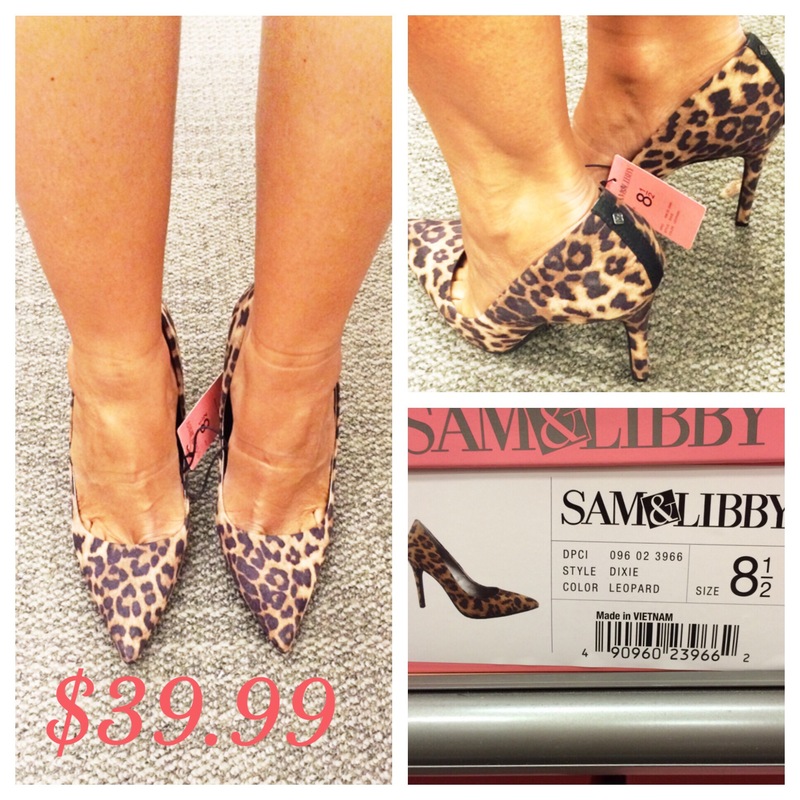 This clever number, at $16.99, does the work for you – it came home with me! 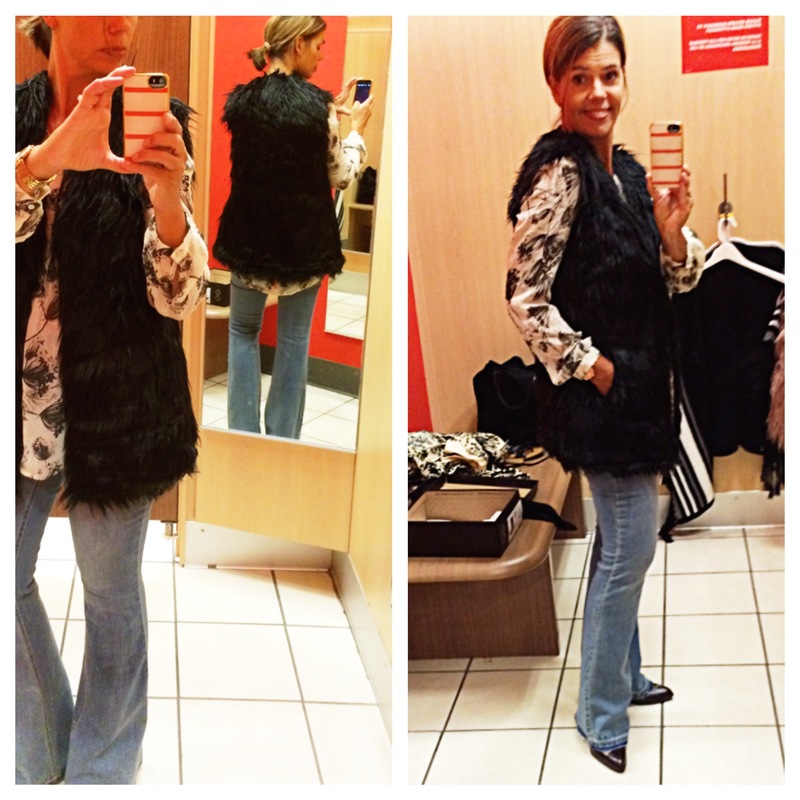 Next up, ready to wear! 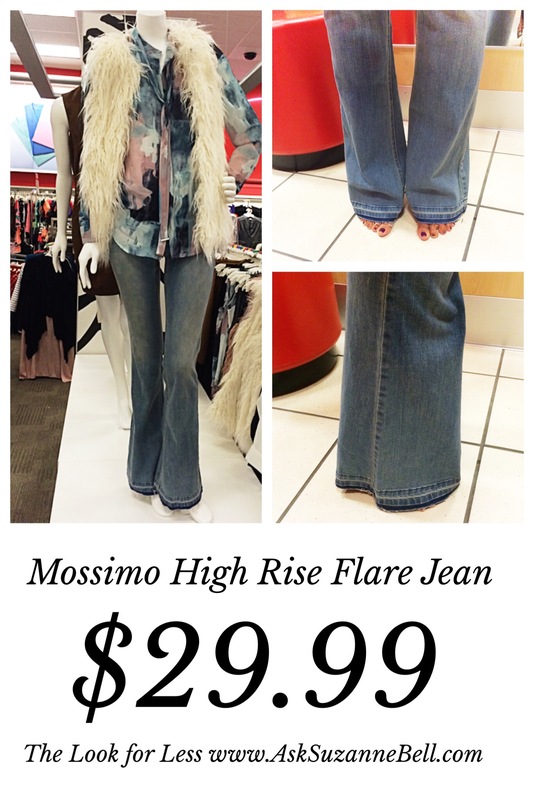 Yep, I found the frayed bottom flare for you all, for $29.99! Fit was true to size, you’ll see it on, in my dressing room reviews, below. Here I am, going in! 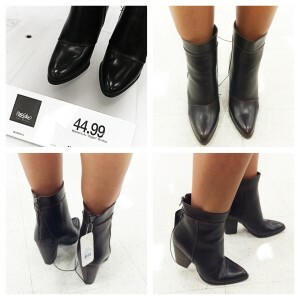 Yes, that is the Aldo ‘Eagen’ bootie with the Mossimo flare jean. Also new at Target, the Fashion Union label. 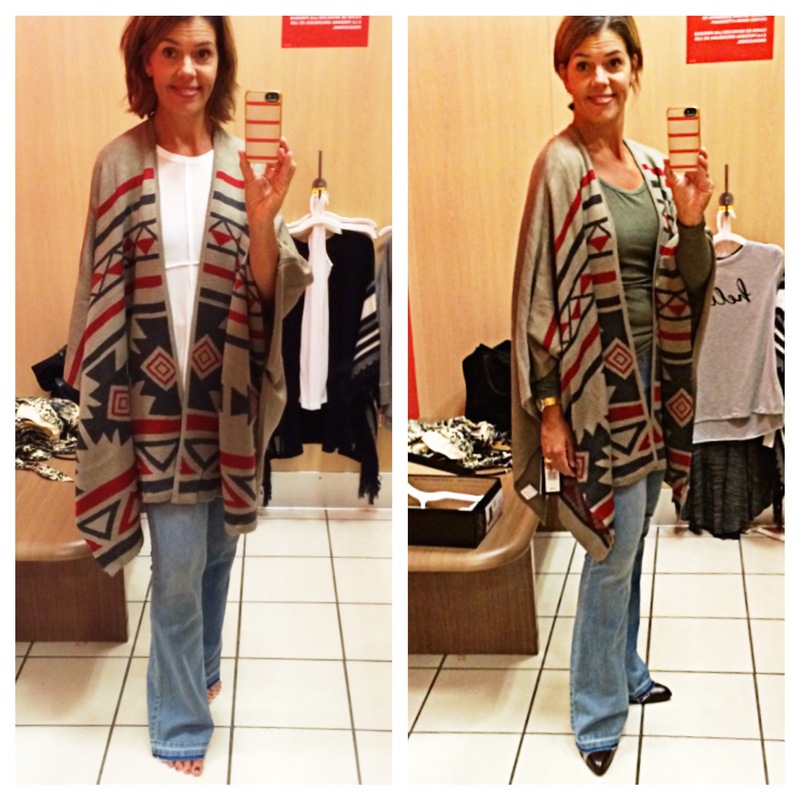 Both of the sweaters above are by Fashion Union. 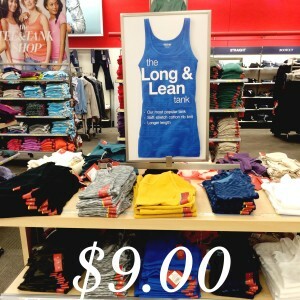 We decided this is a higher end brand for Target, as the quality is a bit better and the price, slightly higher. Price difference between the two is $10.00. The quality on the Fashion Union vest (black) is a bit better. 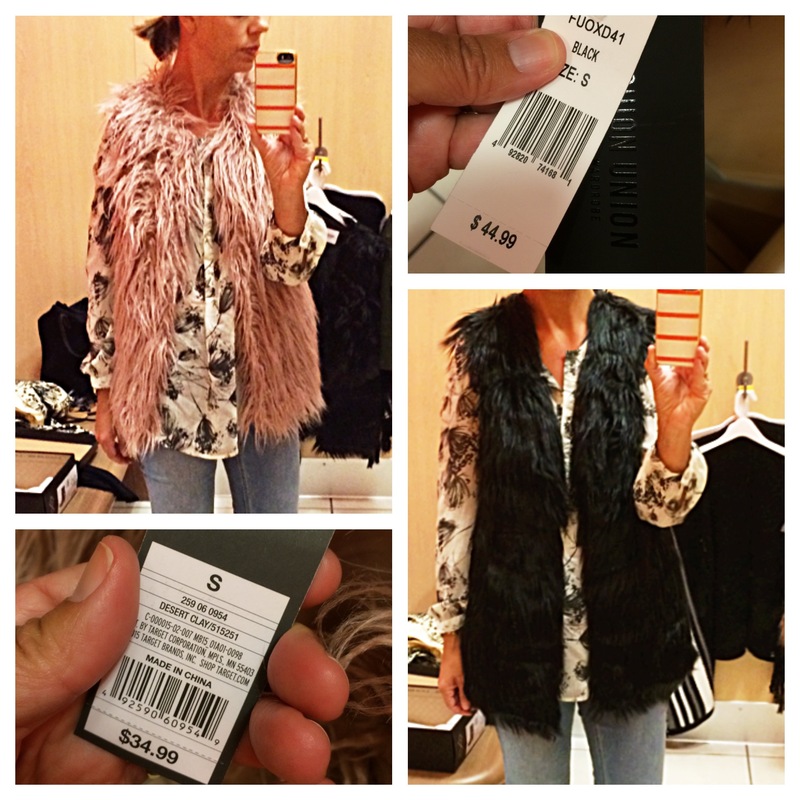 The blush pink Mossimo vest was a really unique color – I love it paired with burgundy tones, olive green and cognac brown. This high low print blouse is a steal, at $24.99. 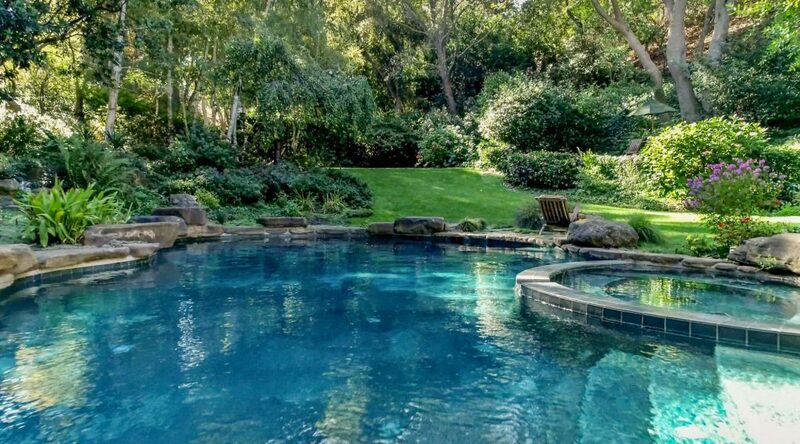 It’s a bit longer in the back which I like. For basics, I liked this ribbed layer tee. 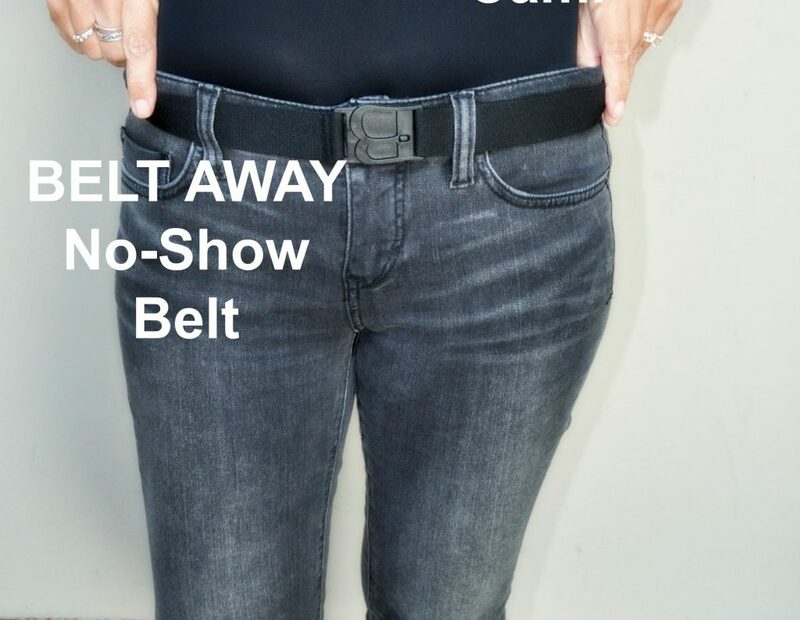 It’s thin, but that’s what makes it a good piece to layer. I liked the longer length and open neckline. 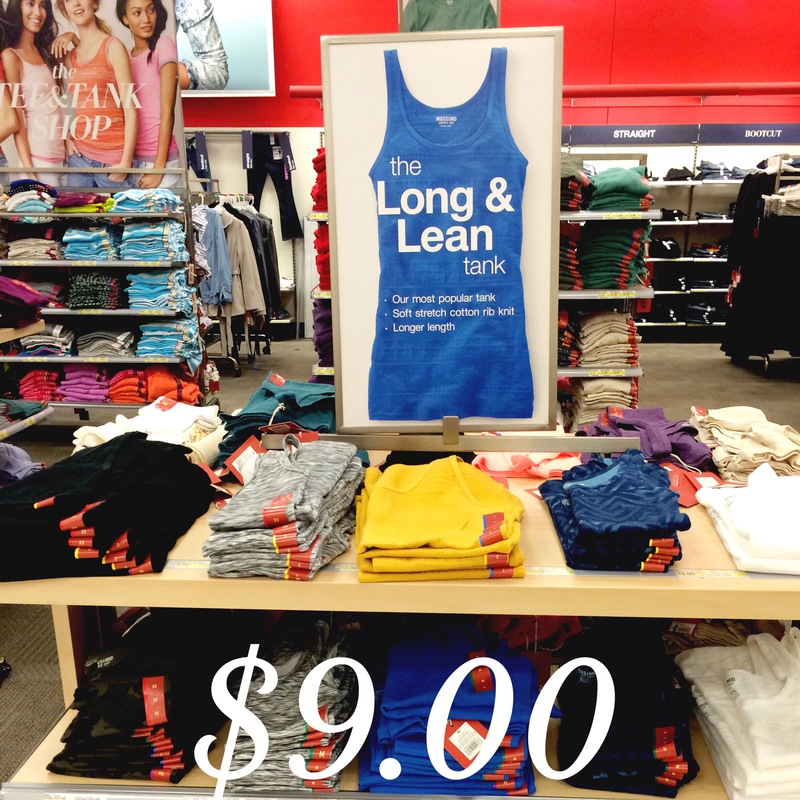 The long and lean tank is another great layer piece at $9.00. 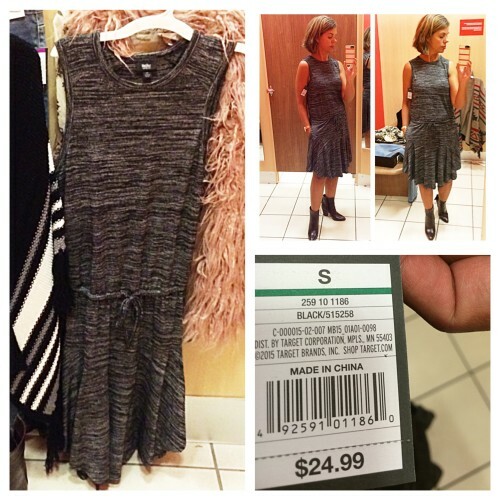 Last up, I thought this drop waist space-dye dress by Merona, at $24.99, was a great fall-transisition piece. Wear now with booties, and later with boots and tights. Well, that’s a wrap! Be sure to pop over to YummoMummo for the rest of our fabulous target finds! 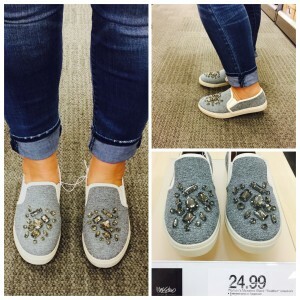 Anyone else checking out Target for fall? Questions or comments? Drop me a line, down below! Great post Suzanne! I have gotten several new fall items from the plus size line Ava & Viv at Target. Colorful skirts and tops as well as a great selection of pants. I can get away with a few of the straight sized items and have looked at that blush fur vest. I am usually pretty adventurous with my clothing, but I am not sure if this might be pushing it for me. 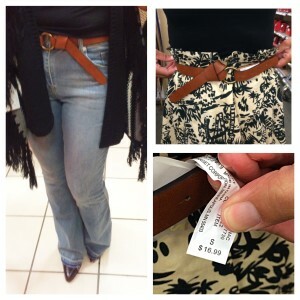 I really need to just try it on! So cool that you went shopping with a fellow blogger. I love it when I get to collaborate with my blogger friends.